August 1, 2014 – Fabulosity Day ONE! | Love Yourself Through It! August 1, 2014 – Fabulosity Day ONE! So, the first stop on the thirty one days of fabulosity tour is really the oldest and loveliest fabulosity I do. I love to take baths. I mean, I really do. Taking a good bath with the right ingredients can not only get your body clean, but can also get that etheric energy scrubbed up too. I mean who cares if you have a squeaky clean crack when your aura is a dumpster, right? So, CLEAN it ALL up! 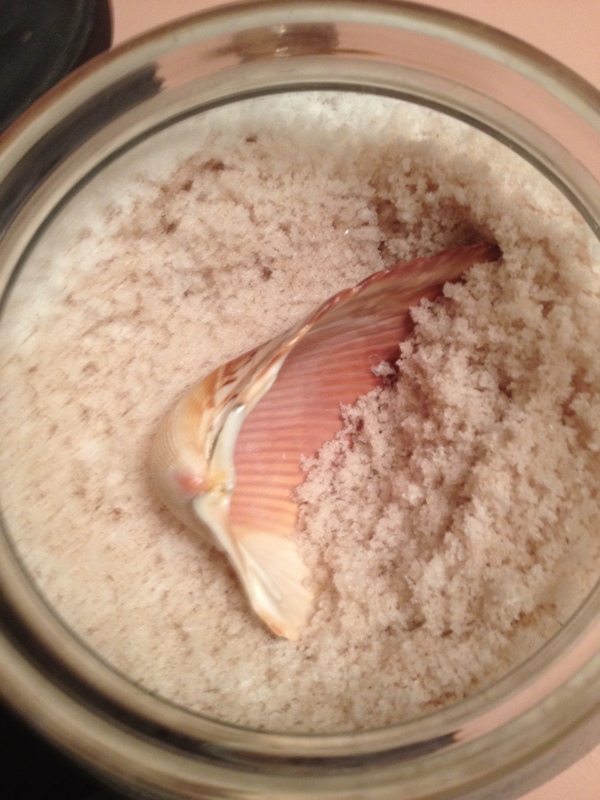 I make several kinds of bath salts. It depends on what I need at the time. They all have some basic components, but vary in oils or salts. I am going to share two of them with you. 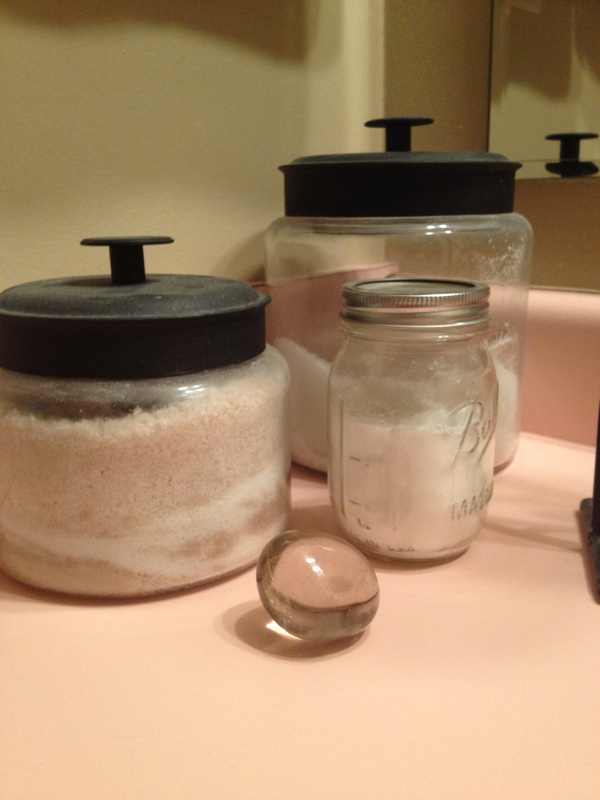 The best thing about making your own bath salts is that you have total control over what goes into your tub, and that includes the intention as well. Your intention is so powerful in making a blend to clear away negativity and allow you to relax and renew your spirit. I have three favorites that I use on a regular basis. You can make them at home mostly with products that you can find right there on your own personal island… or in your kitchen if you are too young to remember Gilligan’s Island. You can see that I keep them in jars so they will be ready made and handy when I am really needing some tubby time after a busy day. Personally I like the clearing aspect of sage and lemon combined with the healing aspect of the lavender. I sometimes will throw something minty in here as well, just because I like the way it smells. 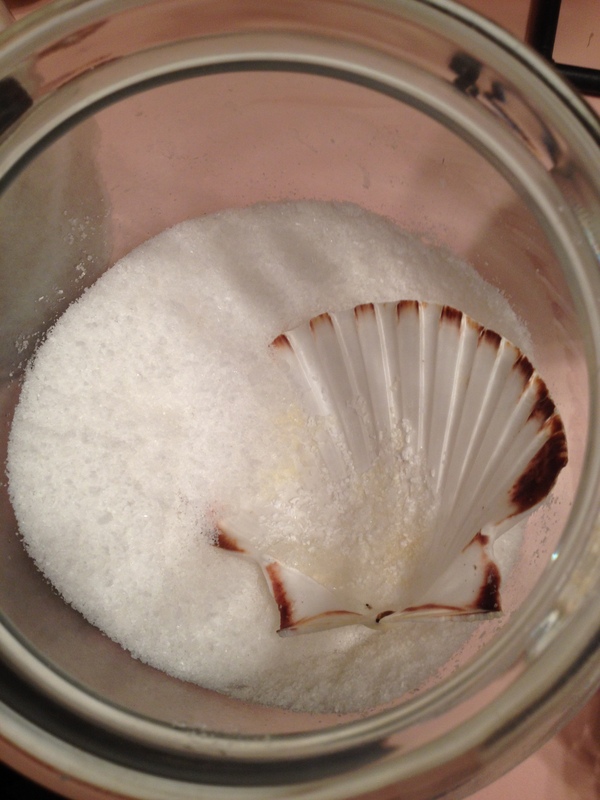 BUT…in the jar goes the salts in a 2 sea salt to 1 epsom salt ratio. Flavor as you go or put in your oils. It is up to you. The initial recipe is good for one bath. Light a candle and relax, ask Archangel Michael to clear you of any energy that is not your own or does not serve your highest self. Thank him. Meditate if you want, or just relax. No more than thirty minutes though, or you will be absorbing it back. Blech. I like to do this at least once a week. I am a psychic, so I tend to pick up and carry a good deal of energy. You may choose to do it less. Whatever works for you is good. I also like to throw in some smokey and rose quarts into the jar so that the essences of those stones permeate through the salts. Smokey quarts absorbs negativity and rose quartz is just big love love love. We all need that. The second bath recipe I want to share with you is a nice self love bath. It is a little unconventional, but it is DIVINE. The ingredients are lush and smell so sensual that you can’t help but love yourself. It is delicious pampering and it makes your skin feel like silk. It makes me feel like Cleopatra or Zsa Zsa Gabor. I don’t know who, but for sure it was someone who wore a tiara or two on their head. White candle, turn out the lights, music if you want to or you can softly hum or chant or pray or whatever makes you feel the calmest. I like to pray to Mother Mary for a few and then chill out and feel my girly girl emerge and take over. She is an indulgent one and I love to be her. No visitors. Just you, the water and the energy. You will feel like a sultry princess in the dimly lit ambiance of your warm and sweet smelling palace. Yes you will, you little fabulosity, you. When your bath is over, slather on some fabulous lotion and go lay naked in your clean sheets. That is bliss, y’all. Sheer bliss. I hope you get some of that kind of stuff. That kind of me time is really the best stuff ever. They say that what you do in your alone time is a true indicator of your character. Well, if that is true, I am gonna take more baths because I am one clean and fierce and sultry female in that alone time! Hope you enjoy these baths. Watch all your troubles go swinging down the drain! Susan I think this is wonderful. I am so excited about taking this journey with you!!!! Wahoo!! !